INEVITABLY in writing the Hitler biography I assembled a large volume of materials about Hermann Göring. Later, I collected papers on his part in the Beerhall Putsch of 1923. I also spent years interviewing his deputy and Staatssekretär Erhard Milch, a field marshal, for a biography; Milch had provided me with his diaries and other papers, and contacts to Hitler's airforce adjutant Nicolaus von Below, and other high ranking officers. From the collection then held by the Führungsakademie der Bundeswehr and private sources I had collected a number of air force diaries, including those of General Karl Koller, General Hoffmann von Waldau (I had to transcribe his very faded and difficult handwriting) and Field Marshal Wolfram von Richthofen; I also found some WW1 diaries of Göring in a collection in Carlisle, Pennsylvania. In the official captured "Milch Documents", to which the British air ministry allowed me privileged access to in the late 1960s, I found the stenographic records of the Reich Air Ministry conferences -- tens of thousands of pages of them. I made a handwritten index as I went along, to facilitate their use by other historians. (It is now at the Institut für Zeitgeschichte). While I was writing the Göring biography, a British auction house became involved in a controversy over several of his WW2 private diaries which it was trying to sell; the German government laid claim to them, and a private deal was reached out of court, whereby the French officer who had looted them sold them instead to the Institut für Zeitgeschichte in Munich. Through the kindness of the then director I was the first to read and transcribe those diaries. In the United States, meanwhile, I chanced upon a very full file of correspondence that had passed between Göring and his first wife, the beautiful Carin. Scattered around various archives, I found the letter that he had exchanged also with his second wife Emmy Sonnemann. The reasult was that eventually I was enabled to piece together a very unusual and realistic biography of the man, based entirely on primary sources, as was my wont. The assiduous reader will notice various differences in structure and content between the different language editions. The German edition, published by Albrecht Knaus Verlag of the Bertelsmann group, minimizes the postwar trial: "You have spent all those chapters depicting the man as a villain," complained Dr Knaus to me, having read the proofs, "and then in the last few chapters you let him rise again and roar like a lion at Nuremberg." That was politically not possible in 1980s Germany. The American/English edition, when complete, proved to be overlong, and the American publishers (William Morrow, Inc.) asked me at a very late stage to cut 2,000 lines out of the galley-proofs. As I said, it was overlong. I achieved the cuts by arbitrarily abridging all the material relating to the industrial power base and expansion of the Luftwaffe: it may seem a pity, as it was essential to the history of the rise of the German air force, but something had to go. The book was very favorably reviewed. I remember with particular pleasure one Sunday in 1989 when I was writing in Key West (working by then on Nuremberg, the Last Battle) and I picked up a copy of The Miami Herald which happened to review the biography: "This brilliant, compelling pageturner of a book," said the reviewer. I hope that it is still as enjoyable for you to read as it was for me to write. THE book is dedicated to its first American editor, Thomas B Congdon (left, in 1979). He and Connie left New York City in 1994 to live in Nantucket, Massachusetts. Recently (2000) he wrote two or three chatty human interest pieces for Forbes magazine. In one, of Nov. 2000, he describes seeing several Christmas pantomimes in England. 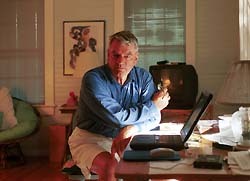 He has also written several "vignettes" for a small Nantucket website. David Irving has been called 'one of Britain's foremost historians' by The Times. He is the author of The Trail of the Fox, The Destruction of Dresden, and other works of contemporary history. THIS IS a very personal biography. Irving proves that Göring was, and is, an enigma. He survived in Irving's judgment through cunning, cruelty, a prodigious amorality and Hitler's loyalty to him. Irving's research effort is awesome." Professor Larry Thompson in The Chicago Tribune, April 15, 1989.